Want to fight anti-Semitism? Teach people about the Holocaust. Posted on May 11, 2018 in: Washington Post|Comments Off on Want to fight anti-Semitism? Teach people about the Holocaust. Douglas Schoen was a pollster and senior political adviser to President Bill Clinton from 1994 to 2000. Arielle Confino is a senior vice president at Schoen Consulting, a firm based in New York. Anti-Semitism has become a national crisis in the United States. In 2017, anti-Semitic incidents were up nearly 60 percent from the previous year, according to an Anti-Defamation League report. 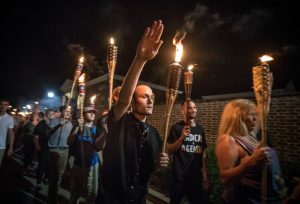 And in the aftermath of the deadly Unite the Right rally in Charlottesville last summer, an ABC News/Washington Post poll found that 9 percent of Americans believe it is acceptable to hold neo-Nazi views. These trends suggest there is an active, virulent group of neo-Nazis penetrating our society — with acquiescence from President Trump. What, then, do we do to change an unsettling and arguably dangerous state of affairs? A new surveyconducted by our firm Schoen Consulting on behalf of the Conference on Jewish Material Claims Against Germany provides clear guidance. Our survey found that the more Americans know about the Holocaust, the more likely they are to eschew Nazism, intolerance and any vestiges of anti-Semitism. The message is clear: We need a broad-scale — and indeed, international — strategy to educate people about the Holocaust. The data from our survey goes deeper than the ABC/Post poll, showing that Americans who had never heard of the Holocaust were twice as likely to condone neo-Nazism than those with knowledge of the Holocaust. Twenty percent of those who have never heard of the Holocaust said it was acceptable to hold neo-Nazi beliefs, compared with just 10 percent of those aware of the Holocaust. Simple awareness of the Holocaust, however, is not enough. To reduce anti-Semitic and neo-Nazi attitudes, we need to develop detail-specific knowledge about the Holocaust. Just 3 percent of those with detailed knowledge about the Holocaust — such as the ability to name a concentration camp or ghetto, or knowledge that 6 million Jews were killed during the Holocaust — said it was acceptable to hold neo-Nazi beliefs. But clear and straightforward as this strategy may be, there was no endorsement of an education campaign at the 6th Global Forum for Combating Antisemitism, hosted last month in Israel. The need to change course is unambiguous. While resources such as the ADL Global 100 suggest that general Holocaust awareness in the United States is nearly universal and outright denial is in the single digits, our study shows that many Americans — regardless of their worldviews — are not familiar with critical details of the Holocaust. About a third of Americans believe that just 2 million Jews or fewer were killed during the Holocaust. And though there were more than 40,000 concentration camps and ghettos during the Holocaust, the survey found that nearly half of respondents could not name a single concentration camp or ghetto. Millennials are particularly uninformed. More than 4 in 10 millennials believe that just 2 million Jews or fewer were killed during the Holocaust, while nearly half of millennials cannot name a ghetto or concentration camp. This becomes all the more troubling given that our survey found that 17 percent of millennials say it is acceptable to hold neo-Nazi views. It’s time we make Holocaust education standardized and compulsory across the 50 states. Right now, only eight states have implemented standardized Holocaust education. It is imperative that the remaining 42 take similar action. More important, we must enhance and expand Holocaust curriculums currently in place — vis-à-vis teacher training and standardized learning plans to ensure that students are learning and retaining the detailed Holocaust knowledge that our survey shows can suppress anti-Semitism. To be sure, there is no single approach that will ensure that something like the Holocaust never happens again. But the numbers are clear: Despite the range of activities discussed at the conference in Jerusalem last month, or that have been championed by the chattering class and media elites, there is one solution that can be implemented to reduce anti-Semitism and neo-Nazi sentiments: educate people early. As we approach the one-year anniversary of Charlottesville, it is critical that we take proactive measures to try to eradicate anti-Semitism in our country. We cannot let the lessons of history be forgotten. They survived the Holocaust. Now the world is forgetting what they endured. Posted on April 30, 2018 in: Together, Washington Post|Comments Off on They survived the Holocaust. Now the world is forgetting what they endured. They have lived so long they are watching the world forget. These Holocaust survivors — who range in age from 79 to 101 — gathered for an annual brunch Sunday in suburban Washington, where they were honored in the twilight of their extraordinary lives for what they had endured and how they had rebuilt in America. There were white rose corsages and boutonnieres, bagels and lox, a nice fruit salad. Edith Mayer Cord, 90, who was born in Vienna and spent her youth hiding and then escaping while family members were taken to Auschwitz, said she never imagined Nazi flags would fly in America in her lifetime. Or that rising anti-Semitism would be part of the national conversation. “I thought it was finished,” she said. Yet over the weekend, President Trump tweeted about “Sleepy eyes Chuck Todd,” the NBC “Meet the Press” host who is Jewish. That is one of Trump’s favorite insults for Todd and one of the descriptions that has been hurled at Jews in the past. It has been on horrifying “How to Spot a Jew” lists since World War II and all over racist, white nationalist websites. Trump has been accused of anti-Semitism before, especially in the wake of Charlottesville. Though the president has Jewish grandchildren, he seems to have lots of sympathy for virulent anti-Semites. Then there is D.C. Council member Trayon White Sr. (D-Ward 8), an elected official right here in the nation’s capital, who wondered aloud last month whether the Rothschilds — a wealthy Jewish banking family often accused of controlling governments — are somehow controlling the weather, too. After White was accused of rank anti-Semitism, he launched an apology tour and agreed to a guided visit to the U.S. Holocaust Memorial Museum for some much-needed education. During the tour last week, Washington Post reporter Peter Jamison saw White insist that a woman in a 1935 photo being publicly humiliated and marched through her German town by Nazi stormtroopers was being protected. By then, White had ditched his tour and his guides and left the museum without explanation, halfway through the visit. When Joel Appelbaum began the survivors’ brunch at the Charles E. Smith Life Communities in Rockville eight years ago, it was in the spirit of honoring the people and their remarkable lives. There were 50 of them, and very few wanted to talk publicly about their experiences, but they gathered and told small snippets of their stories to tablemates. That is part of the survival, packing it away. Because how can you live a life of paying bills, doing dishes, raising the kids and sitting at a desk if you keep remembering the Nazi stormtroopers who machine-gunned everyone in the house while you — tiny, terrified you — hid in the closet during the bloodbath? If you keep lingering on the moment when half the people you were with were marched out to the freezing river, shot and thrown into the current when you were just 5 years old? If you remember the packed, hellish train to Auschwitz, during which 70 people in the train car died and you were one of 40 who survived — only to face the horrors of a death camp? There is a new urgency in remembering those stories. Two-thirds of American millennials polled did not know what Auschwitz is, and 22 percent had not heard of the Holocaust or were not sure if they had, according to a new survey conducted by the Conference on Jewish Material Claims Against Germany. In their sunset years, the incredible Maryland survivors are opening up. A handful of them went to the microphone at the Progress Club in Rockville on Sunday and told small stories they had not told before. Because something has changed in this country. Not that it is easier. Josiane Traum, 79, still choked up as she talked about the incredible act of bravery by her mother, Fanny Aizenberg, who lived through all the signature horrors of the Holocaust — from beatings by the Gestapo, to time in Auschwitz as a laborer and medical experiment subject — after giving her little daughter up to people who said they would hide her. They did see each other again. They sat next to each other at the brunch, representing the alpha and omega of the survivors’ age range, 79 and 101. Aizenberg, the grande dame of the survivor’s group who still volunteers at the U.S. Holocaust Memorial Museum once a week, refuses to be called a hero. “I don’t know how I survived,” she said. The horrors are so profound. The stories grotesque and cruel, especially when told in a setting of china and stemmed water glasses. The horrors are not gone. Never has that been clearer with this group than now. All of those ideas are still here. But we must never, ever let anyone pick them all up.